My post today is a card using a couple of Susan’s new releases Garden Notes – Forget- Me- Not and Garden Notes Frame It – Ovals. By now you can see I love the new Frame It Ovals there is also Circles, Squares and Rectangles in this new release as well. Step 1 Create 6″ X 6″ card base from white cardstock. Step 2 Cut patterned paper 6″ X 6″ adhere to card front using Clear Double Sided Adhesive. 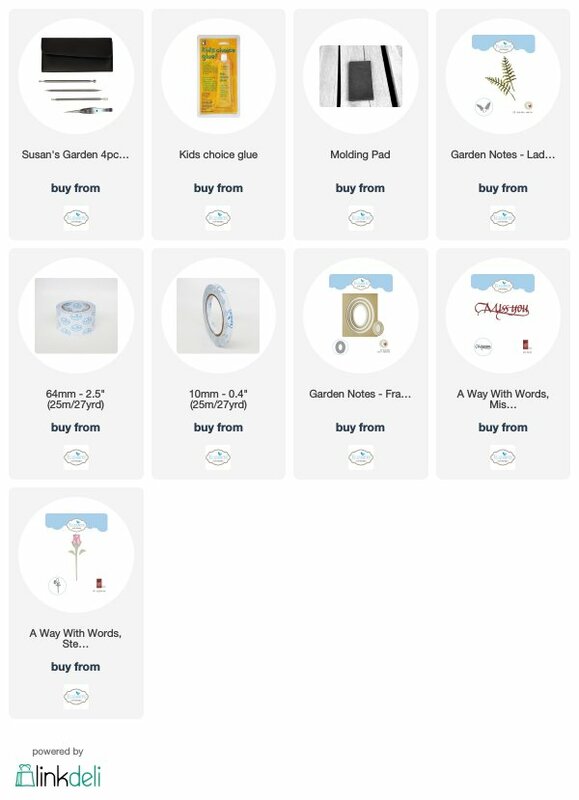 Step 3 Cut white Soft Finish Cardstock 6″ X 6″ using next to largest Susan’s Garden Notes – Frame It – Ovals. Place die 3/4″ in from left side and equally between top and bottom – you want to leave room on right to stamp sentiment die cut oval. Stamp sentiment (you want to stamp before adhere just to make sure you get good image)using black ink. (Stamp I used here was one of Susan’s original Seeds of Thought Red Rubber Stamps at Elizabeth Craft Designs but I could not find it so not sure that it is available anymore but you can use another sentiment.) Using Clear Double Sided Adhesive just around outer edge adhere to card front. Step 4 From clear plastic (I like to save plastic packaging as it is heavy) or mylar cut Garden Notes Canning Jar. On back side of jar using a darker gray alcohol marker make line for water line then color below blending in using a lighter gray. Adhere jar to card front using Kids Choice Glue around just the outer edges leaving jar opening free of glue so you can get stems down in jar. I tucked bottom of jar down inside of oval. Step 5 From green cardstock cut stems using Garden Notes Bouquet Stems & Branches die set. Cut off top half put couple dabs of Kids Choice Glue on back stick stems down in jar. Cut 3 Garden Notes Forget-Me Not stems add to jar. Step 6 Cut flowers from white Soft Finish Cardstock using Susan’s Garden Notes Forget-Me-Not which is a brand new release. Using alcohol markers color flowers then shape using Garden Notes 4 pc. All Metal Tool Kit along with Molding Mat and Leaf Mat. Cut leaves from green cardstock shade with ink and shape. Susan has video on her Facebook page Susan’s Garden Club which you can find at this LINK. Add flowers to stems at top of jar using Kids Choice Glue then add leaves. I do hope you have enjoyed this tutorial and that it has inspired you to make your own card, thank you for stopping by! my inspiration picture – picked from my backyard. Yes I do have a pink blossom here and there in bouquet as that is how they grow every once in a while you find a pink blossom or 2 on a plant of blue blossoms. 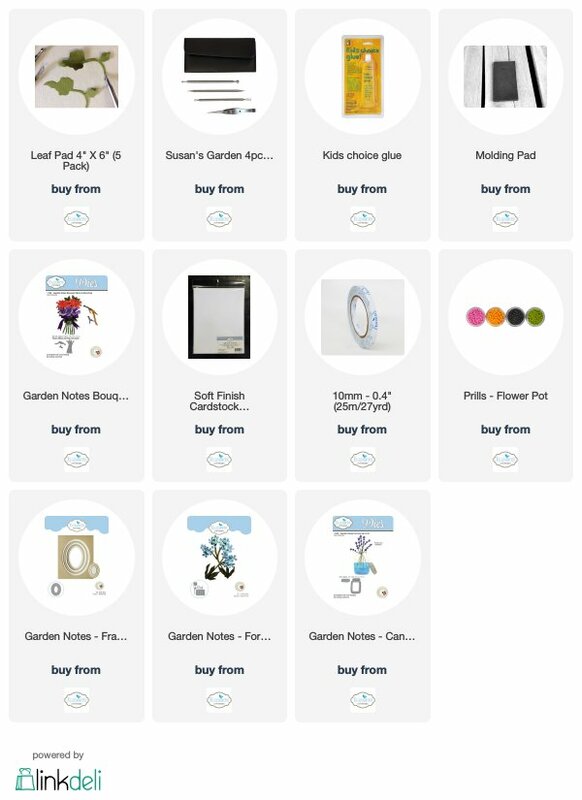 If you click on any icon for Elizabeth Craft Designs supplies below it will take you directly to that product on their site for you to view / purchase. Today is another Focus Day on Elizabeth Craft Designs Blog. The Design Team has been busy creating cards that are showcasing A Way With Words brand new release of dies. I have chosen Miss You and Long Stem Rose to showcase. 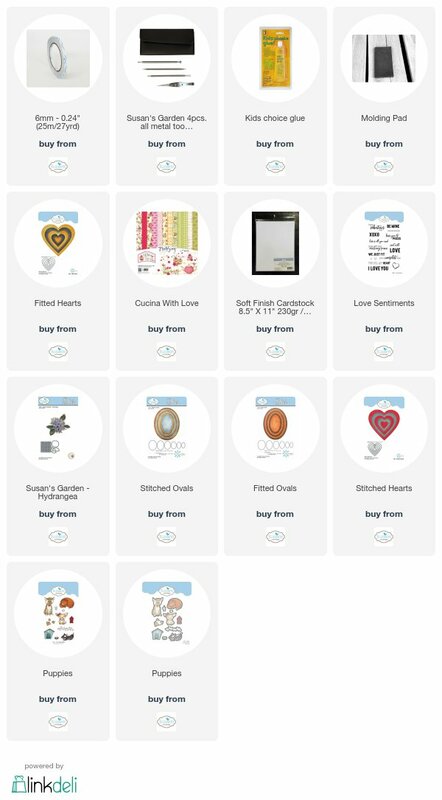 Be sure to visit Elizabeth Craft Designs Blog at this LINK to see what other design team members have created using the new dies. Step 2 Cut patterned paper 6″ X 6″ using largest oval from newly released Garden Notes Frame It – Stitched Ovals die cut oval in center. Attach to card front using Clear Double Sided Adhesive. Step 3 From green cardstock cut set of Garden Notes Ladder Fern shade with ink shape by pinching up fronds around tweezers from Garden Notes Tool Kit. Using Kids Choice Glue on just on lower portion of stem adhere to card front inside oval. Step 4 From 2 shades of patterned paper using new release A Way With Words – Long Stem Rose die set cut rose then from green cardstock cut stem and shade with ink. (I used the same paper that was used for the card front it happened to be 2 sided) Assemble Rose & Stem using Kids Choice Glue. When dry lay right side down on molding mat using medium ball tool from tool kit rub back of rose to give little dimension. Adhere to card over ferns using Kids Choice Glue on stem and just very edge of rose. Step 5 Cut twice A With Words – Miss You once from cardstock with Clear Double Sided Adhesive on back once from dark cardstock once from coordinating cardstock attach coordinating Miss You over dark offsetting just a little to give shadow effect. Attach to card front. Step 6 Add pearls to corners. Thank you for stopping by my blog today and hope that you have enjoyed this quick tutorial and be sure to pop on over to Elizabeth Craft Designs Blog at link above to see what other designers have created using dies from the new release of A Way With Words by Suzanne Cannon. By Clicking on pictures below they will take you directly to Elizabeth Craft Designs shopping page. Today my post is a card I designed using one of Krista Schneider’s brand new releases available today at Elizabeth Craft Designs. I have chosen to use the Puppies Stamp Set along with it’s coordinating die set. Be sure to visit Elizabeth Craft Designs Blog to see the design teams creations focusing on Krista’s new releases. Thanks for visiting my blog today I do hope that you will check out the new releases of Krista Schneider’s at Elizabeth Craft Designs.